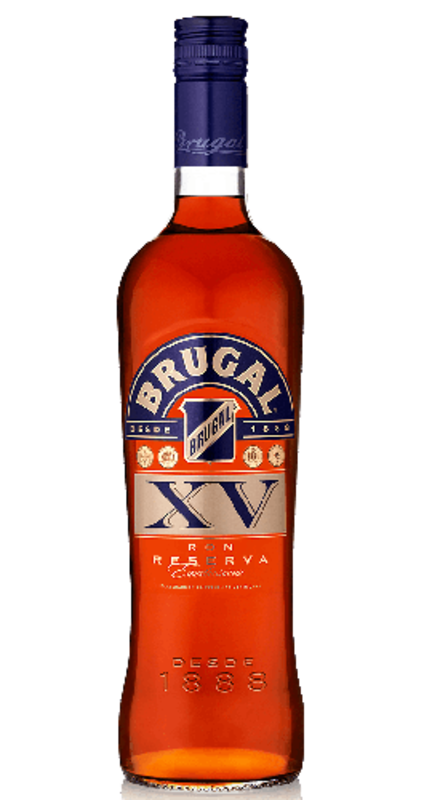 Have you found an online vendor selling Brugal XV? The XV was a nice surprise to me. Brugal have tried to make a more smooth tasting rum, compared to their normal dry notes, and have done a nice job with this. I let the label and the name convince me that I was having a bargain. Hey, I thought. A 15 year old rum for that price? The screw-top should have been a warning. Barely any aroma, nice soft sweetish taste, very light after-burn. Not that I didn't like it, but definitely not a sipping rum. Nice with some ice and a splash of soda, though. Only tried it with coke. Nice, but not exceptional. No nose (lol) and very sharp on the tongue when sipped. Ok with coke but will not be a keeper in my bar, no real depth, very flat. Good aftertaste. Aged in a combination of ex-bourbon American white oak and European PX-seasoned casks, this is a spicy and rich rum. Brugal XV is a blend of three to eight year old rums. It was launched in 2013 and replaces the Brugal Extra Viejo. It's made with a combination of rum aged in ex-bourbon casks, and rum aged in ex-Pedro Ximenez sherry casks. The casks are the same which The Macallan uses, showcasing some synergy within The Edrington Group, after its 2008 acquisition of Brugal. Not bad, and while I prefer to sip my rhums, if I need some to mix, I choose this one, as it is not on par with other on the same price range. Not complex, not particularly pleasing. Pas mal, et même si je préfère déguster mes rhums nature, si j'ai besoin d'un rhum pour un cocktail, je choisis celui-ci, car il n'est pas à la hauteur d'autres dans la même gamme de prix. Pas complexe, pas particulièrement agréable. It is a sweet rum were you can tast honey. There is also a tast and smell of wood. Its decent but nothing fancy. Middenmoot, een 6,5 zou beter zijn maar het is geen heel indrukwekkende rum. Wellicht goed voor in de mix. Good price foto a 15year rum... Not an exceptional good taste, but really not a bad one. Among the others dominican rums Brugal is good. This XV is pretty dry and mild. It have sherry cask notes that makes it more interesting to drink neat. The good price for 25$ can made it one of my on-duty rum! A fairly bland and unremarkable rum. I would not say that it was a bad rum, but then again compared to most 15 year old rums, I'd probably use that very word. It's kind of off-dry...just a hint of sweetness, but there is very little flavour compared to the best sipping rums. With XV Brugal has definitely improved their rum offering. With a bit of tipping you can usually get XV in place of the lesser offerings at the all-inclusives in the Domincan Republic. It is definitely smoother and quite easy to drink, however it does not have the well developed flavors of the better sipping rums. It's a very good everyday rum. It has a very noticeable alcohol taste. Nice amber color, with notes of green apples and berries. A great ftom for the price. Nice nose, pineapple, artificial cocos like cocos-flavored soap. Taste a little bit boring and weak, what a pity. Some brown sugar. Soft alcohol, means easy to drink but no masterpiece. Here "tasty but not quite great" fits for me. No finish. I recently went to the Dominican and wanted to bring some rum home with me. This was one of the ones I chose and was very happy. Great sipper. You can mix it or drink it neat, eighterway its great. Having tried Brugal 1888 (which I really enjoy) and Brugal Anejo (not so much) in the past, I thought I would further explore the Brugal line of rums with the purchase of Brugal XV ($38.50 CAD in my area). Based on the ratings on this site I did not have and great expectations but was really pleased with this rum. First of all it is very dry (which I like) and also light. I expected this rum to be used as a mixer but I am very comfortable with using it as a sipper. On the nose, there is a slight smell of caramel that is present but the taste is surprisingly very enjoyable with a long lasting pleasant slight burn. Overall I was pleased with this rum and will keep definitely keep a supply on hand. Well done Brugal. I picked this up last week in duty free in P. Plata airport. $15 / £11:50. Smoother than I expected at the price. Perfectly drinkable either neat or over a ice cube. Not tried it with coke yet, but I imagine it will be spot on. If you are at a airport with a few dollars to get rid of, it’s well worth a try. Now tried with coke, fine. Even better with ginger ale, asvin Dark and Stormy, even though itd not s dark rum.